SEOUL: North Korean leader Kim Jong Un said on Tuesday his “historic” summit with US President Donald Trump in Singapore stabilised regional security, and that he expected further progress at an inter-Korean summit aimed at reviving stalled nuclear diplomacy. Kim thanked South Korea’s President Moon Jae-in for bringing about the Singapore meeting in June as the two leaders began their third round of talks in Pyongyang. “Thanks to that, the political situation in the region has stabilized and I expect more advanced results,” Kim told Moon, referring to the Singapore gathering, at the start of their talks. The Kim-Moon summit will be a litmus test for another meeting Kim has recently proposed to Trump, with the South Korean president seeking to engineer a proposal that combines a framework for the North’s denuclearization and a joint declaration ending the 1950-53 Korean War. Moon expressed gratitude for Kim’s “bold decision to open a new era”. The first session of the talks, which lasted for two hours, were held at the headquarters of the North’s ruling Workers’ Party Central Committee, with party vice chairman Kim Yong Chol and Kim Jong Un’s sister Kim Yo Jong, as well as South Korea’s national security adviser Chung Eui-yong and spy chief Suh Hoon in attendance. Kim greeted Moon with hugs and handshakes as the South Korean leader landed in the North’s capital with a mission to rekindle momentum in faltering talks between Washington and Pyongyang over denuclearization and a formal end to the 1950-53 Korean War. As Kim escorted Moon to the Paekhwawon State Guest House, where Moon will stay during his three-day visit, Kim said he wanted to produce a “bigger outcome at a faster pace” than the two leaders have achieved so far. Moon, himself the offspring of a family displaced by the war, has met Kim twice this year at the border village of Panmunjom. 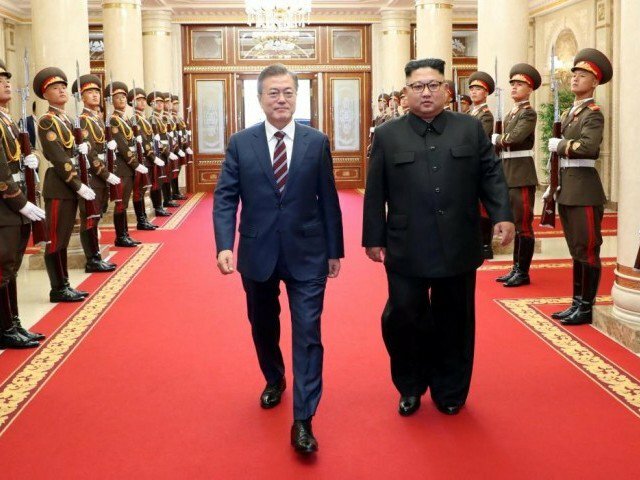 Moon said it was “time to bear fruit” and thanked Kim for his hospitality, which included a massive welcome ceremony at Pyongyang International Airport featuring a large, goose-stepping honor guard and a military band. During their motor parade through Pyongyang’s landmark Ryomyong Street, a new residential district launched last year under Kim’s initiative to modernize the city, Kim and Moon briefly stepped out of the vehicle to greet and take flowers from members of the crowd. Trump has asked Moon to be “chief negotiator” between himself and Kim, according to Moon’s aides, after Trump canceled a trip to Pyongyang by his secretary of state last month. Washington wants to see concrete action toward denuclearization by North Korea before agreeing to a key goal of Pyongyang – declaring an end to the 1950-53 Korean War. The conflict ended with an armistice, not a peace treaty, leaving US-led UN forces including South Korea technically still at war with the North. South Korea is pinning high hopes on Kim’s remarks to Moon’s special envoys earlier this month that he wants to achieve denuclearization within Trump’s first term in office ending in early 2021. “If North Korea-US dialogue is restarted after this visit, it would have much significance in itself,” Moon said before his departure. Underscoring the challenges ahead, North Korea’s official Rodong Sinmun said on Tuesday “the responsibility falls squarely on the United States” for the stalled nuclear discussions. “It is due to its nonsensical, irrational stubbornness that other issues can only be discussed after our country has completely verifiably, irreversibly dismantled our nuclear capabilities… without showing the intention to build trust including declaring the end of war,” the newspaper said in an editorial. On Wednesday, Moon and Kim plan to hold a second day of official talks after which they are expected to unveil a joint statement, and a separate military pact designed to defuse tensions and prevent armed clashes. Moon will return home early Thursday. Traveling with Moon are South Korean business tycoons, including Samsung scion Jay Y. Lee and the chiefs of SK Group and LG Group. They met North Korean Deputy Prime Minister Ri Ryong Nam, who is in charge of economic affairs, although Seoul officials said they did not expect any specific joint economic projects to be agreed given extensive international sanctions. The United States is pressing other countries to strictly observe UN sanctions aimed at choking off funding for Pyongyang’s nuclear and ballistic missile programs. North Korea says it has destroyed its main nuclear and missile engine test site and has halted atomic and ballistic missile tests, but US officials and analysts believe it is continuing to work on its weapons plans covertly. US Ambassador to the United Nations Nikki Haley accused Russia on Monday of “cheating” on UN sanctions on North Korea.